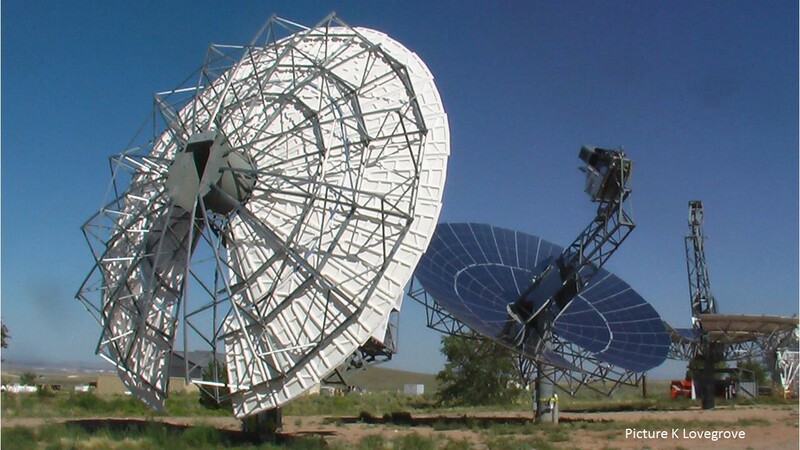 The high concentrations and hence high temperatures that can be achieved with dish systems open up many options for energy conversion. On the other hand the fact that the receiver is changing orientation and moving through space is a significant practical constraint on what can be achieved. Any fluids that are transferred from ground level must pass through flexible couplings for each of the two axes of rotation. In a full CSP system, the solar concentrator field is the single biggest capital cost contributor and represents typically more than half of the total investment. 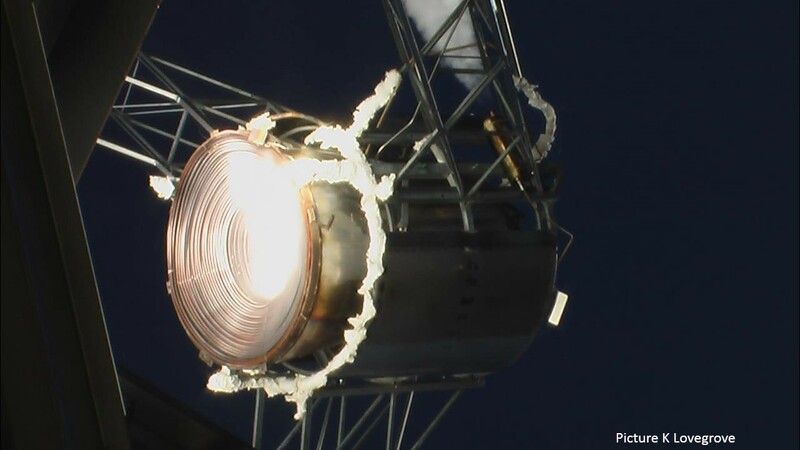 If dish systems can deliver that component cost effectively given their high optical and thermal efficiencies, it is worth seeking to tailor the receiver based energy conversion to suit. Overall a full system design optimisation is needed. 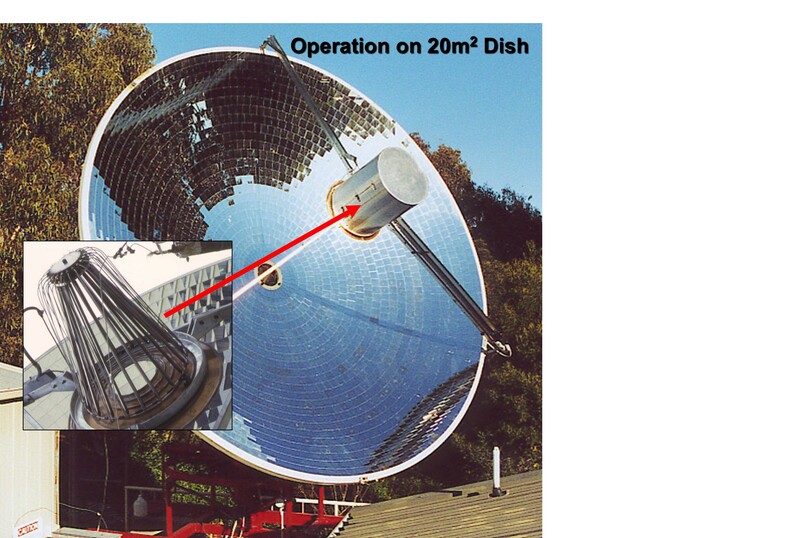 Most of the work on dish systems to date has been applied to focus mounted Stirling engine / generator units. Very high performance has been achieved with these, however production levels have never been high enough to bring costs down. The dish Stirling configuration is now severely challenged in the market place by the fact that it does not yet have a proven thermal energy storage. Without that it is effectively competing head to head on price with PV systems and that is a major challenge. Storage systems are being investigated however and once perfected, the dish plus Stirling plus storage combination would then give very high conversion efficiency plus great benefits of modularity. An alternative approach that receives investigation, is continued operation of the Stirling engine with gas combustion when off the sun. The ANU Big Dishes have been tested with success using a monotube boiler / receiver for direct steam generation. Such units can potentially produce the highest pressures and temperatures of steam that are needed for the highest performance steam turbines. Steam line networks and rotary joints to bring the steam to ground level have been developed and tested without major issues. However with the increased emphasis on energy storage for CSP systems, the main drawback of direct steam generation is the difficulty of coupling a suitable storage system. Good progress is being made however on three stage storage systems that match a solid liquid phase change material to the liquid vapour phase change and then add single phase thermal stores to match the feedwater heating and superheating tasks. Dishes can readily reach temperatures needed to drive endothermic chemical reactions (ie anywhere from 500 to 2000+ Degrees C). The concept of thermochemical energy storage involves the use of a reversible chemical reaction in a closed loop. Reactants are fed to the dish receiver when the sun is available and decomposed in an energy storing (endothermic) reaction. The products can be cooled and stored and then later recombined in the reverse energy releasing (exothermic reaction) when the heat is needed for power generation. 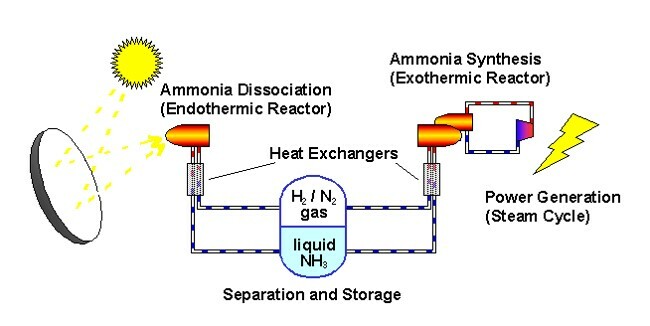 The ANU group worked for many years on the use of ammonia decomposition for this application. The experimental investigation lead to the demonstration of a complete labscale closed loop using a 20 m2 dish. The cycle works by compressing air (with a compressor turbine), adding heat and then expanding it (through an expander turbine) to get a net output of shaft power for a generator. In conventional operation the air heat is achieved by combusting a gas or other fuel in the compressed air. If instead the air is directed to a receiver that is capable of heating it to the temperatures of around 1000 Degrees C that are needed, then solar driven operation is possible. Several research groups are looking at this possibility. This site established 31 March 2014. Last edited 16 March 2017.